Growing with technology and committed to quality, we are an eminent manufacturer, exporter and service provider of a number products and services such as stainless steel pipe fittings, dairy turnkey projects that cater to the clients in different industries. Our range includes heat exchangers, SS pipe fittings, SS centrifugal pumps, volute casing pumps, steel plug valves, SS fabrications, dairy turnkey projects, ice cream turnkey projects and other projects for chemical, pharmaceutical and food industry. Leveraging on our industrial expertise and manufacturing techniques, we have developed a strong infrastructure. Supported by advanced production facilities and our competent workforce, we render our services to our clients in dairy, food, brewery, chemical and pharmaceutical industries. Set up in Kolkata and have been catering to an extensive clientele in different parts of India and world. Over the years, we have seen new horizons and reached new heights under the guidance of Mr. Gautam Barui and Mr. Pinaki Pani Bhattachrjee. We have our registered office in Kolkata through which we endeavor to cater to the eastern region of the country and to maintain regular contacts with the customers in other parts of India and world. 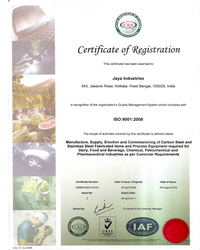 Our compliance with highly precise customer specifications serves as a constant objective for our company. We ensure that the products manufactured by us conform to the international quality and yield maximum output. Made from high quality stainless steel and other raw materials, the stainless steel centrifugal pumps and stainless steel pipe fittings manufactured by us are durable in quality and are precision made to suit the different applications. Each and every process, from procurement of raw materials to final production is under the surveillance of industry experts. Total Quality Management (TQM) aids us to deliver best of quality proven equipment. For our engineering projects, our quality controllers assure that equipment / plants are established and commissioned as per set requirements of customers. Experts under their stringent vigilance, strive to seek utmost customer satisfaction.  Machine shop - 1200 sq. ft. Committed to meet the industrial expectations of our clients in the global arena, we are led by a team of professionals that is technically sound and hard working. We are empowered with a qualified work force of 68 persons that includes 25 technical and skilled persons who are experts in the field of design, marketing, production, after sales service. Qualified and competent, our professionals understand the importance of high quality products. 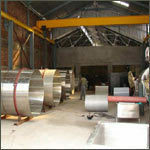 Hence, they come up with premium quality stainless steel fabrication, stainless steel pumps and stainless steel fittings. We also have the support of our engineers and supervisors who ensure that the turnkey projects are executed properly and no loopholes are left for any flaws.